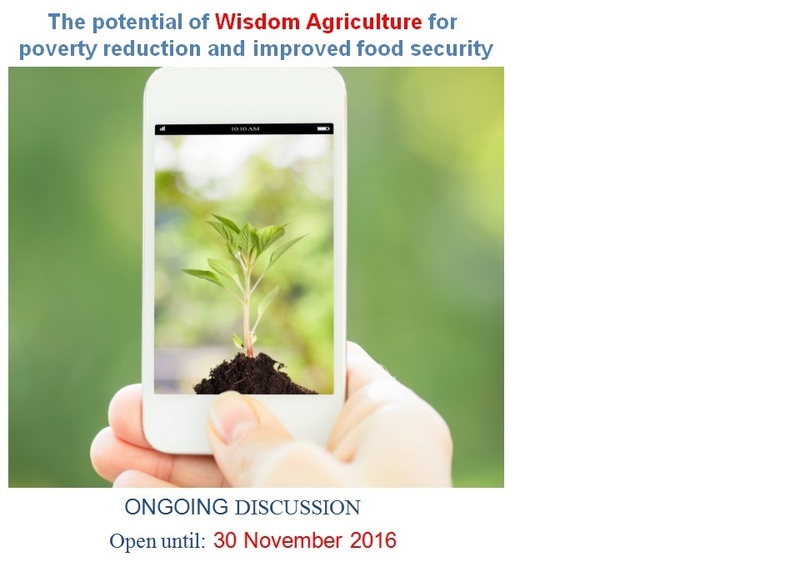 It is a matter of great pleasure to invite you to this online discussion organized in the context of the ‘APEC Wisdom Agriculture Workshop’ which takes place in Yinchuan on November 24-25, 2016, in China. The Workshop aims to review the existing methodologies, advanced technologies and best practices of Wisdom Agriculture in order to train young researchers from APEC economies and build their capacity in this field. The workshop is hosted by the Agriculture Information Institute of Chinese Academy of Agricultural Sciences (AII of CAAS). Wisdom Agriculture, as it is known in China, is the holistic application of information and communications technology (ICT) to agriculture. This means taking full advantage of modern information technology achievements including computers and networks, internet of things, cloud computing, 3S technology (Remote sensing, Geographic information systems, GPS), and wireless communication technology in order to develop agriculture. Using these technologies can provide farmers, policy makers and development organizations with information that is more complete thanks to improved remote sensing, more detailed data, better communication tools, intelligent control of agricultural production and management and a better provision of public services to agriculture. This carries huge potential for making farmers produce more and better food all while making them better off economically and improving food security and nutrition. This online discussion will add additional value to the workshop by allowing for an inclusive exchange on how the use of ICTs in agriculture, as practiced in APEC economies and the rest of the world, fosters poverty reduction, and promotes the establishment of market linkages for smallholders. It will also allow you to share which technologies are best suited for the different local contexts and can provide the greatest benefit for local and global food security. With information technologies becoming more common in agriculture, to what extent can they contribute to poverty reduction and increased food security? What are the specific challenges and bottlenecks for the full realization of Wisdom Agriculture in APEC Economies? How can a conducive policy environment be created? Are there any examples of effective applications of ICTs in the agriculture of your economy during the last decade that have had a positive impact on food security and rural livelihoods? What is the status of the use of technologies in your economy, such as the internet of things and agricultural robots? How can smallholder farmers benefit from agricultural product traceability systems? Anyone interested can join the discussion in either English, Chinese, French, Russian or Spanish. Please feel also free to circulate this information among your colleagues. Your comments will help inform the workshop and foster the exchange of knowledge on this important aspect of agricultural development. On the days of the workshop the preliminary results from the training sessions will be shared with all of you, while the inputs received through this online discussion will be discussed at the meeting. Our sincere thanks go to all of you for the active participation and the open exchange of views!